Want to visit all of Iceland’s most amazing sights, but only have one day? 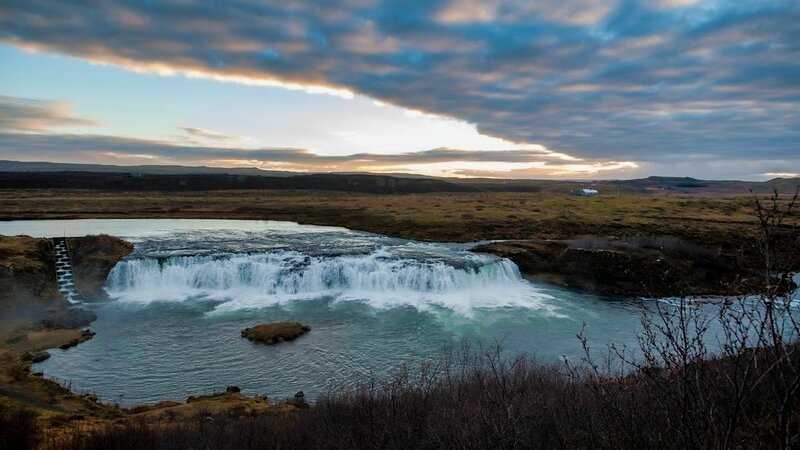 Our Grand Golden Circle Tour is an effortless introduction to the best of Iceland’s stunning scenery. On this coach tour you will experience all the colors of Iceland, from turquoise water to deep red rock to golden waterfalls. How can a waterfall be golden, you ask? Read on to find out, or better yet, reserve now and see for yourself! The Golden Circle, sometimes called the Golden Ring, is one of Iceland’s most popular routes. And you’re about to find out why! 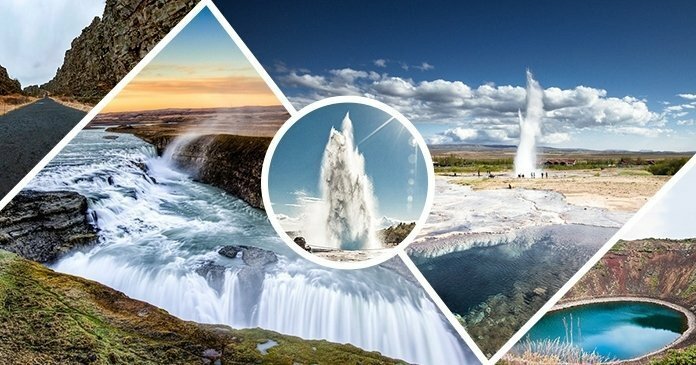 The Geysir geothermal area, the Gullfoss Waterfall and the Þingvellir National Park. Plus, you will visit some bonus stops: the secluded Faxi Waterfall and the stunning Kerið volcanic crater. Our job is to make this action-packed day easy and relaxing for you. Our online bus booking service makes your reservation quick and simple, so you can get on with the fun! After a smooth, no-fuss pickup, climb aboard a comfortable sightseeing bus, sit back and enjoy as the unique landscape slides by your window. You’ll learn the hidden secrets of Iceland’s fascinating scenery and history from an expert guide. 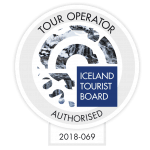 Other travelers have said that our funny, knowledgeable guides were the highlight of their trip – along with the beautiful Icelandic scenery, of course! 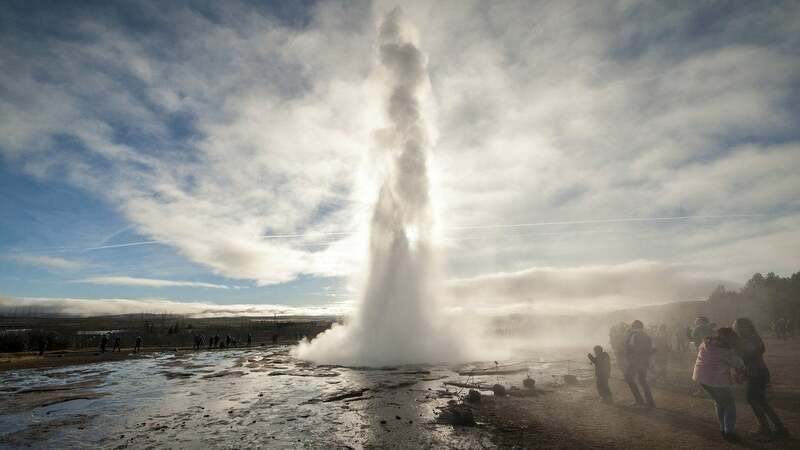 You may even learn something unexpected: did you know that we have the English word “geyser” because of Geysir in Iceland? More on that in a bit – first, let’s dive into the highlights of the tour. We took this tour in May 2018 and had a great time! Our guide Howser was an absolute delight, introducing us to the wonders of the Icelandic horse, regaling us with stories from Iceland's saga times, and entertaining us at the end of the day with new Icelandic music. But the real star of the tour was Iceland's stunning natural beauty and geothermal wonders. This was a five star experience -- not to be missed! Howser was our tour guide!!! He was phenomenal. Best tour I have ever taken of any country I have visited. He was very informative of all the places we visited and the history of Iceland(very interesting!). Would definitely recommend this tour!! I absolutely recommend this tour from Bustravel. Our guide Rock was just amazing, very knowladge guy who keep us entertained the whole day. We had enough time at each stop. Very good value for what you pay. I already booked the Southern Iceland tour for Sunday so I am looking forward for a new adventure. Excellent experience. 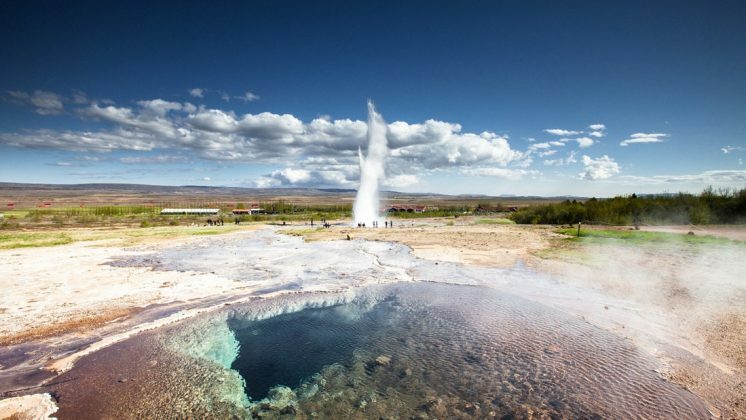 Your Golden Circle day trip begins with a pickup from Reykjavík in the morning. Just wait for the bus at your hotel or one of the designated pick up points. So what’s the first stop? 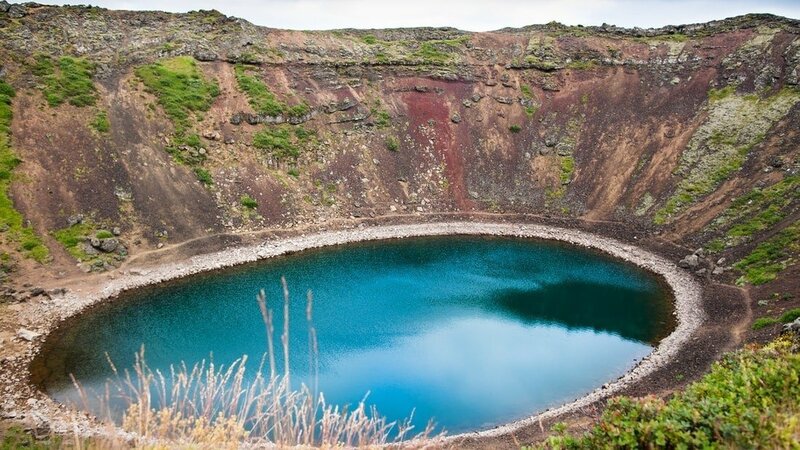 Our first attraction on the Golden Circle route is the striking Kerið (Kerid) volcanic crater. You’ll have the chance to gaze out across the milky blue-green crater lake to the stark black-and-red slopes. The vibrant colors of the crater bring to mind what the volcano must have looked like erupting with lava thousands of years ago. Next, we will make a quick stop at the lovely Faxi waterfall. This hidden gem is a great chance to get the perfect photo. 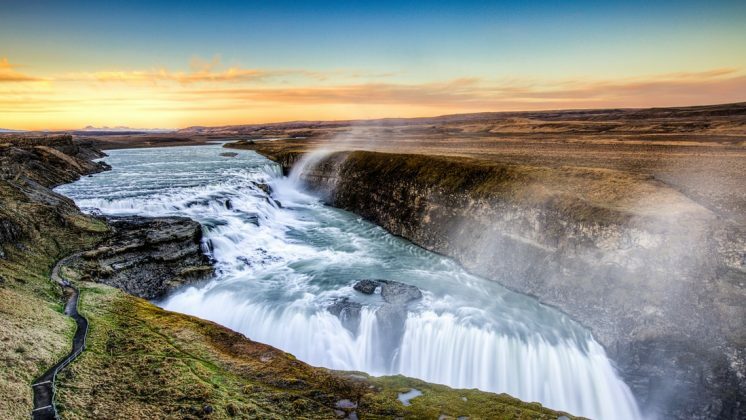 After this, you will journey on to one of the most famous waterfalls in Iceland: the Gullfoss Waterfall. Visiting Gullfoss is an awesome experience – in the true sense of the word. From beside the falls your ears fill with the booming sound of the glacial waters of the river Hvítá roaring down 32 meters to the canyon below. Gullfoss waterfall in winter is especially breathtaking. Surrounded by pristine snow, you’ll witness the crashing waterfalls transformed into shimmering cascades of ice. We’ll drive to the nearby Geysir geothermal area. It’s named after the Great Geysir, which was the first geyser ever mentioned in print. Its fame led to the word “geyser” appearing in English. Geysir never erupts nowadays, but Strokkur geyser in the same hot springs area has enough energy for the both of them. Enough to spout boiling hot water 30 meters into the air every 8 minutes! And if all this steam makes you crave a hot cup of tea or coffee, never fear – you’ll have time to grab lunch and your favorite beverage while you’re here. Your tour isn’t done yet—our last stop on the Golden Circle classic tour is the famous Þingvellir National Park (also spelled Thingvellir National Park). This UNESCO World Heritage site combines fascinating aspects of history, geology, and even fantasy. 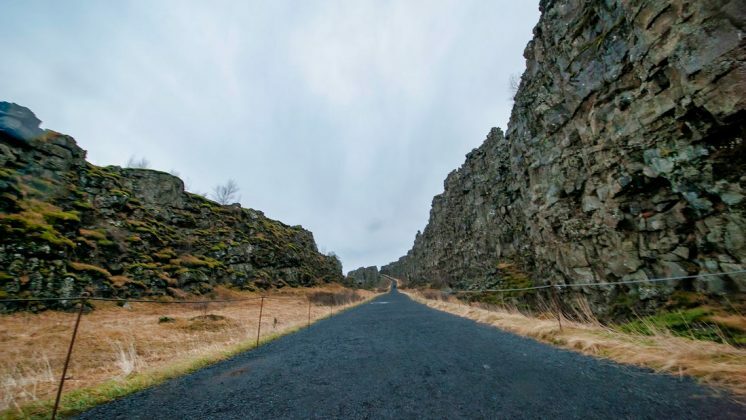 Standing on the soil of Þingvellir, you can imagine the grinding of the North American and Eurasian tectonic plates as they meet deep in the earth beneath your feet. Or, imagine yourself as your favorite hero journeying across Westeros! Many scenes from Game of Thrones were filmed right here in Þingvellir, with its wild and majestic scenery. After this, we will head back from Þingvellir to Reykjavík and drop you back to your starting point for a well-earned rest. Be ready at the designated time for your pickup for the Golden Circle Iceland Tour. Pickup may take up to 30 minutes, so you might have a short wait for the bus. You can request a pickup from selected accommodations or meet at one of the Bus Tour stops in central Reykjavík. Feeling tired from all your travels and want to sleep in? No problem! We also offer the Golden Circle Afternoon tour, which leaves later in the morning and covers the main stops in a shorter time. Want to soak your muscles in a relaxing geothermal lagoon? Choose the Golden Circle Secret Lagoon tour. Be sure to pack your bathing suit! Want to see as many sights as you possibly can? Add even more amazing scenery into your day with our small group tour option. This is the best Golden Circle tour if you want to see as much as possible. On this route we will take you along the same Golden Circle stops, plus make extra stops with our Golden Circle premium minibus tour. Don’t miss the chance to experience the natural wonders of Iceland in one day with our Golden Circle Tour – check availability now to book your Iceland adventure!